If a stabbing pain is the central symptom of your headache, you may have what's commonly referred to as an "ice pick headache," and it can be as jarring as the eerily descriptive name suggests. If you've experienced an ice pick headache, you may have felt an intensely sharp jabbing sensation, often around your eye or temple area. The stabs or jabs do not appear in a pattern, but rather come about erratically, one to multiple times a day. The pain lasts a very short time, usually 3 seconds or less. In about 30 percent of people, the pain occurs in one fixed spot, whereas with the rest, the pain moves around. When the headache stabs are fixed on one spot, a headache specialist first must rule out a cranial nerve problem or brain structural problem (e.g., a tumor) with imaging tests. Once a nerve or brain problem is ruled out, these ice pick headaches are referred to as primary stabbing headaches. It's interesting to note that some people with ice pick headaches report their headaches begin with or are worsened by exposure to bright light, stress or movement during a migraine. This implies that you can experience both a migraine and an ice pick headache at the same time (a double whammy, so to speak). Moreover, if you have a history of migraines, you are more likely to experience ice pick headaches. When they do occur simultaneously, most people experience the stabbing pain on the same side of the head as the migraine. 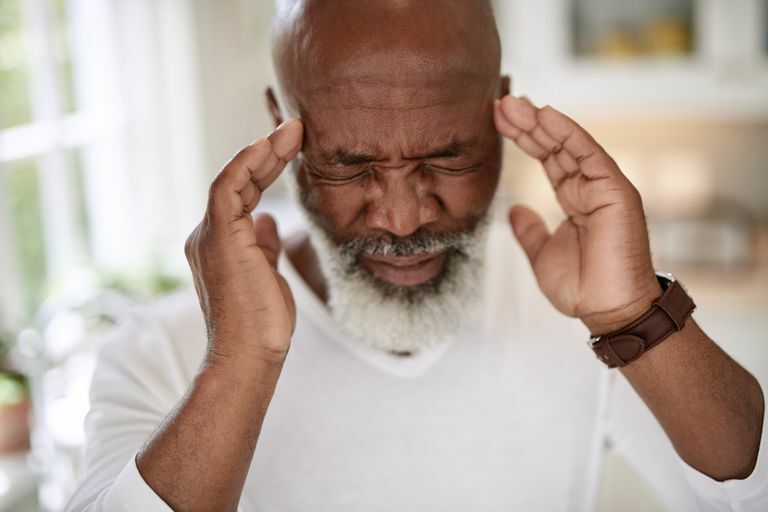 Ice pick headaches are also linked with cluster headaches—a type of primary headache that causes severe, disabling piercing or burning pain around a person's eye or near their temple. Aside from the association with migraines and cluster headaches, little is known about the cause of ice pick headaches. Some research suggests a relationship to cranial trauma, benign cranial lesions, the herpes virus, a disease of the blood vessels in the brain, or nerve sensitization. At this time, though, there is no conclusive scientific data to support any one particular connection. Due to the short-lived nature of these headaches, treatment may not be needed, unless they are severe. In that case, preventive therapy is recommended. To prevent ice pick headaches, doctors traditionally prescribe Indocin (indomethacin), a nonsteroidal anti-inflammatory medication (NSAID), similar to ibuprofen. Indocin, however, is linked to some adverse effects like stomach and intestinal bleeding and kidney problems. This is why (as with any medication), it's essential you speak with your doctor first before taking an NSAID—this way you can ensure the drug is safe and right for you. Besides Indocin, researchers have looked into alternative medications without much success. COX-2 inhibitors (like Celebrex) may be beneficial, but they too carry adverse effects like Indocin, although are believed to be gentler and safer on the stomach. Melatonin—the same neurohormone used to aid jet land insomnia—has also been used to prevent ice pick headaches. Available without a prescription, melatonin can still cause some adverse effects, like fatigue, dizziness, and mood changes, so a physician should be consulted before beginning a melatonin regimen. Also, even though it's considered "natural," the long-term effects of melatonin are unknown. Moreover, melatonin is not a regulated supplement and is not recommended for women who are pregnant or nursing. Since ice pick headaches often coincide with other types of headaches, self-care strategies may be helpful in soothing your pain. Another consideration is to keep a descriptive headache diary, which can provide your doctor with an accurate account of your head pain. The diary can also help people with stabbing headaches notice what activities may be contributing to their headaches, and what medication seems to soothe them. Ice pick headaches are not common, but if you are afflicted by them, they are painful and can be burdensome. The good news is there are treatments available. Also, for many people, their ice pick headaches are so short-lived and not persistent that treatment may not even be necessary. Regardless, be sure to see a headache specialist for a proper diagnosis of your headaches. There are other very serious health conditions that may be mimicking your ice pick headaches, and those need to be ruled out first. Ferrante E, Rossi P, Tassorelli C, Lisotto C, Nappi G. Focus on Therapy of Primary Stabbing Headache. J Headache Pain. 2010;11(2):157-60. doi: 10.1007/s10194-010-0189-0. Hagler S, Ballaban-Gil , Robbins MS. Primary stabbing headache in adults and pediatrics: a review.Curr Pain Headache Rep. 2014 Oct;18(10):450. doi: 10.1007/s11916-014-0450-3.